Intel BLKDH67CLB3 - this motherboard collected on an Intel chipset H67. The type of Socket 1155. 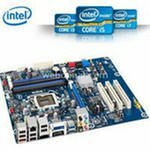 Processor support the second generation of processors Intel Core i7 / Core i5 / Core i3. This motherboard supports the Serial ATA 3. Its capacity is 6 Gb/s, so with his help, hard disks will be able to show their maximum performance. And the new USB 3.0 will allow us to connect a new peripheral device.